Initial guesses envisioned the movie maxing out around $65 million for the weekend, so Legendary, who provided 75% of the funding, and Warner Bros., should be pretty happy with these results. With an opening like this, they’re well on their way to earning back their substantial $160 million investment. And this is all just domestic grosses, and does not take into account the worldwide box office take. Reviews have been generally positive, though they range from calling the film a near masterpiece to a few that flat out hated it. 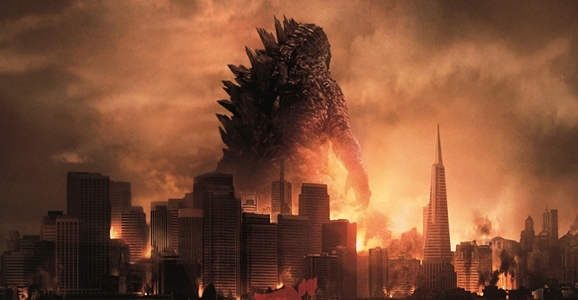 The movie delivered everything I wanted, and I totally loved it, but, as with a movie like Pacific Rim, I get how some people don’t like Godzilla. The human side of the story is pretty nonexistent, and most of the characters are there to react to giant monsters stomping through cities. Then again, you had me at giant monsters stomping through cities. This next little bit involves SPOILERS for those of you who haven’t seen Godzilla yet. You’ve been warned. For those of you who made the trip to the theater, you saw the opening credits, with all of the redacted stuff, kick off the film with an air of mystery and hint at the government cover up that surrounds the existence of giant, primordial monsters. If you’re like us, you probably caught a little bit here and there, but out of context you don’t really know what to make of it. Not that anything here is essential. The device is more than enough, and though there are a few fun Easter eggs, you get the point they’re going for. Over at Badass Digest, one of their loyal readers works in a movie theater and, with access to a frame-by-frame viewing, he was able to transcribe everything written on screen. And in that spirit, here you go. Enjoy. WARNER BROS PICTURES AND LEGENDARY PICTURES PRESENT a terrifying tale of disaster and woe. Furthermore, the creature must be eradicated. These fauna are a danger to all life on earth. A LEGENDARY PICTURES PRODUCTION to destroy this creature and all DNA evidence. A GARETH EDWARDS FILM the certain magnitude of the weapon is enough to turn everything to dust. ELIZABETH OLSEN emphasized that there are monsters in the depths of the pacific. Walter Malcolm has claimed that government men dressed in white lab coats routinely appear at site and BRYAN CRANSTON shortly after the event all residents are sworn to silence. There are many references to living dinosaurs in the bible. Such is the case in Job 41 71-14 and Isa 27 VICTOR RASUK to as “Leviathan”. There are countless other passages that refer to “dragons” as well. As a matter of fact, “dinosaur” is a relatively modern term which means “terrible lizard”. Nebuchadnezzar’s favored God, the priests CASTING BY Bel and the dragon relates SARAH HALLEY FINN, CSA dispute. Are these animals real? Can we prove they even exist or are they merely men in rubber suits with COSTUMES DESIGNED BY tricksters SHAREN DAVIS we may never learn the answer ‘what lurks below’. The call response of bats may give us clues. VISUAL EFFECTS SUPERVISOR JIM RYGIEL has used sonar to map this communication. SOUND DESIGN by its nature is always ERIK AADAHL a disruptive and ETHAN VAN DER RYN violent birthing process for all parties. Not to be discussed with FILM EDITOR BOB DUCSAY. This confidential document must not be shared. The illuminati has been using PRODUCTION DESIGNER OWEN PATERSON to build facilities to hide their study of the creature and it’s origins. All clues are suppressed. The bomb site is classified and will be detonated at 0800 pacific. DIRECTOR OF PHOTOGRAPHY SEAMUS MCGARVEY will shoot. There will be no living organisms on the island. The only proof we have lies within EXECUTIVE PRODUCERS PATRICIA WHITCHER ALEX GARCIA ledgers notes. EXECUTIVE PRODUCERS YOSHIMITSU BANNO KENJI OKUHIRA are looking into the possibility of hunting Muto. Reliability of these sightings is still questionable BASED ON THE CHARACTER witnesses. One must ask, is GODZILLA OWNED AND CREATED BY TOHO COMPANY, LTD. This is the Zuiyo-Macu carcass first described in a Japanese STORY BY New Zealand fishermen in 1977. The carcass DAVID CALLAHAM was decaying and weighed 4000 lbs. This dinosaur had been dead for about thirty days. Pseudo Scientists tried to say this was a mere basking shark. There are photos of animals yet to be named. In the new SCREENPLAY BY occult author and nature enthusiast MAX BORENSTEIN, he seems to explain what these odd animals are. There is all kinds of fun stuff to pick through here. Some of this information appears in the movie and serves as part of the background, like the about nuclear submarines. In addition, you also see the scope and breadth of cover up, like how a 1977 encounter with a monster carcass was hidden form the public. By far, however, the most entertaining pieces are the little inside jokes, like the question of whether these creatures are real or just guys in rubber suits, and “occult author and nature enthusiast” Max Borenstein.